Why do I need additional software to run DOS programs and print to Windows printers? How does DosPrint solve those problems? How do I Install or Uninstall DosPrint? How much does DosPrint cost? The video nearby shows the solution applied in 2 minutes! What does DosPrint do to run a DOS program in Windows and print to an installed printer? DosPrint is a freeware program that allows you running DOS programs on modern Windows computers (64 bit too) and printing to Windows printers (including USB, GDI and PDF virtual printers) by installing specialist third party programs specifically designed to solve these common DOS problems. The DosPrint.exe program checks if your Windows version is 32 bit or 64 bit (in the last case a DOS emulator is needed to run a DOS program, otherwise Windows itself can already run it), then it suggests you the best additions for your specific computer. Yes, with a couple of clicks you can have DosPrint making all the job for you in a few minutes. Yes, your DOS program can even print the same printers you're used to use with Ms-Word or Internet Explorer, including virtual printers, like PDF writers / e-mailers. When running a DOS program on a modern Windows computer you might see a message like "Unsupported 16-Bit application" or "This app can't run on your PC", or similar. That's because DOS programs are 16 bit while most of newer computers nowadays are 64 bit, so they cannot natively run a DOS program without a DOS emulator. 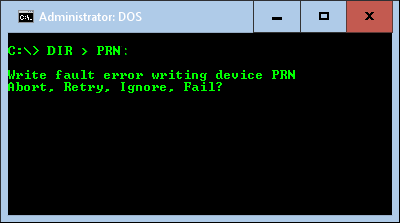 If instead you're already running your DOS program through the Standard Windows Command Prompt (on a 32 bit Windows version), but you've seen the error message "write fault error writing device PRN" or "ERROR TERM/0 Print error" (or similar) when printing from your DOS application, that's because DOS programs could only print to LPT (parallel) ports (usually LPT1:, that's an alias for PRN:) or, in rare cases, COM (serial) ports, and modern computers don't integrate those ports anymore. At the DOS age, USB, IP, Wireless, virtual ports were simply unknown, so no DOS program can address them directly. How the DOS problems above are solved by DosPrint? To solve the running problem there's a widely known, free, DOS emulator, named DOSBox. DOSBox was originally designed to keep using popular DOS games on modern 64 bit Windows computers, so it lacks of some important features for business DOS programs, like parallel ports (LPT) support for printing (games usually don't need to print). For this reason from that project derived several variants, like DOSBox MegaBuild 6, DosBox SVN Daum, vDos, vDosPlus (and others) intended to add missing features to the original DOSBox emulator and make it functional for business DOS programs. So, with a DOSBox variant that does support parallel ports you can run the DOS program and use a DOS compatible printer (if you still have one) even on the 64 bit machine. 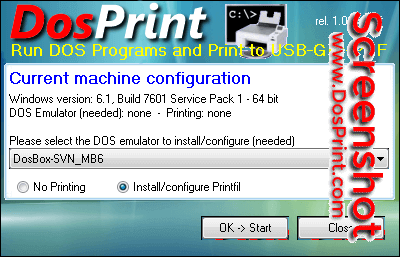 If instead you only have modern printers installed on your Windows computer (32 or 64 bit), connected to ports that DOS cannot address directly, you can solve the printing problem by the Printfil software, that captures the data sent to the LPT or COM port by the DOS program and redirects it even to the USB, GDI, IP, PDF printers on Windows (physical or virtual). Printfil also adds modern functions to DOS printing, like print preview, background image merging (useful to print an invoice including the form that previously was intended to be preprinted by typography for example), PDF automatic export / e-mailing and others. The additional programs above are Freeware or Shareware (this means you don't have to pay to use them, or you can freely use them for a trial period, then you're required to pay a registration fee to continue using them) but it may be hard to decide which are the best ones for your specific case (do I really need a DOS emulator for my own computer? - Does it have to support LPT ports?, COM ports?, both? ), and even once decided, you've to learn how to configure them; usually by manually editing long text files and see if the changes works by trial and error. DosPrint does this job for you, by automatically downloading, installing and configuring the programs (above) you've selected to solve your DOS problems. So, in a few minutes you'll solve your DOS problems and print your reports, then you can relax and eventually study the manuals to fine tune some DOS parameters qietly. How do I install / uninstall DosPrint? DosPrint doesn't need to be installed on your machine. Just download and run it (it's the single DosPrint.exe program that does the job). So, DosPrint doesn't even have to be uninstalled later on. Once DosPrint has installed the best additional programs to solve your DOS problems, you can just delete the DosPrint.exe program from your machine; it's no more needed to run your DOS programs and make them printing to Windows printers. If instead you want to uninstall the additional programs (installed by DosPrint as per your choices), you can do it by their uninstallation tools in the Windows Start menu and/or by the "Add/Remove Programs" icon in the Windows Control Panel. For more info about how to uninstall them please refer to the documentation installed with those programs and their websites. How much does DosPrint.exe cost? Depending which programs you'll choose to install to solve the Run and/or Print problems you may be required to pay those developers a fee for those programs (some of them are Shareware; please check the documentation installed with those programs and their websites once you've found out those that are working for you), but no fees are required for this DosPrint.exe program. Do you offer some kind of support? Since it doesn't need to be installed on your machine (simply run the DosPrint.exe program) and it doesn't have to be configured (just select a couple of choices and click a button), we doubt you'll ever have the need for support about DosPrint, however, if you've some question, find a bug, wish to send us some comment or suggest another DOS emulator to add in DosPrint, you can use the contact form below: we'll do our best to answer you as soon as possible. If instead you've questions or need support for configuring the preferred DOSBox variant you've installed, please note we didn't write them ourselves, they're third-party software available on the internet, so, please contact directly their manufacturers as indicated in the documentation installed with those programs and their websites. If you need help with the Printfil program, you can contact the Printfil support at this link.